Also available as an eBook in the Google eBookstore and in a Kindle Edition in the Amazon Kindle Store. Beyond presenting Universalist and Unitarian history in America as more than a list of luminaries, Buehrens weaves a historical tapestry rich in color and meaning that will serve to deepen the faith of modern Unitarian Universalists. John Buehrens begins his new history with the observation that "Religion is people." While previous accounts of Universalism and Unitarianism have focused on a few great men, this history shines a light on the contributions of many, both exalted and obscure, whose stories illustrate the texture of lived religion. Both faiths are chronicled in parallel development through their consolidation in 1961. Beyond presenting Universalist and Unitarian history in America as more than a list of luminaries, Buehrens weaves a historical tapestry rich in color and meaning that will serve to deepen the faith of modern Unitarian Universalists. Here in America, most early Universalists and Unitarians developed their religious institutions without much imported influence. Their movements were “American originals,” arising independently in the era of American independence itself.2 They arose among people reacting against Puritan Calvinism, although in different social contexts. Both sought more humanistic expressions of Christianity. Over time, both became even more inclusive. Both also produced notable leaders and had a disproportionately large influence on American culture and public life, despite never becoming institutionally large themselves. Most previous histories have treated American Universalism and Unitarianism separately.3 They have also tended to emphasize intellectual or institutional history. This short survey deals with both Universalists and Unitarians in parallel development. It emphasizes the lives of people, because “lived religion” in the past can best be approached through biography. It does not ignore intellectual and institutional developments and their leaders. But it pays attention to some Unitarians and Universalists who did not become well known. Since neither group was ever large, but each produced more than its share of American notables, both groups have taken great pride in their most famous members. Yet the history of Universalists and Unitarians in America is more than a list of luminaries. Just as we look up at the sky and often see only the brightest stars, neglecting the patterns formed among those of second and third orders of magnitude, so we have sometimes overlooked some of the most interesting people in our past. "John Buehrens's people's history is at once a comprehensive narrative of Unitarian Universalist history and an invitation to rethink that history. The big names are all here, but they share space with forgotten feminists, rural radicals, and faith-filled capitalists. By telling many stories, Buehrens invites all Unitarian Universalists to find their place in our tradition's living heritage." "John Buehrens has given us a lively and informative account of American Universalism and Unitarianism, and has brought a number of important figures in UU history into well-deserved recognition. 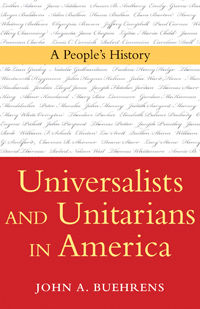 Universalists and Unitarians in America provides an excellent and very welcome narrative of the movement in the twentieth century, emphasizing its notable contribution of important leaders such as Mary White Ovington and John Haynes Holmes to crucial progressive political causes. His well-considered explanation of the merger of the two denominations in 1961 is a highlight, and he also provides an indispensable account, both well-researched and experienced first-hand, of the new UU movement that emerged in the later twentieth century." "At last! A vibrant history populated by real human beings, not just dates, ideas, and famous figures. John Buehrens brings the North American Unitarian and Universalist traditions to new life through the stories of people both ordinary and fascinating, all struggling to realize their dreams for liberal religion in the context of their times." "In this grassroots chronicle of Unitarian Universalism, John Buehrens takes a number of fascinating roads less traveled by. He moves some of the focus away from men, ministers, and institutions, and introduces us to laypeople, women, and families who shaped our story just as much as our already celebrated heroes did. It is both an engaging complement to, and a useful corrective for, many of our existing histories."